December, January and February temperatures were all colder than average across Iowa. As a result, the risk for Stewart's disease of corn in 2009 is low to negligible throughout all of Iowa, based on two predictive models. Stewart's disease, also known as Stewart's wilt, is caused by the bacterium Pantoea stewartii. An insect vector, the corn flea beetle, plays a critical role in the plant-to-plant spread of this causal microorganism. The bacterium survives winter within the gut of hibernating corn flea beetles. If winter temperatures are mild enough for the corn flea beetle to survive, the pathogen will also survive. In the spring, surviving beetles infested with the bacterium will emerge from grassy areas near corn fields and begin to transmit the pathogen to corn seedlings as they feed. Stewart's disease can occur at any stage of plant development, but symptoms are almost always associated with flea beetle feeding. Corn seedlings can wilt rapidly from systemic infection, and seedling death is common, especially in seed corn and sweet corn fields. Plants that do survive will be stunted and will serve as a source for future generations of corn flea beetle to acquire and spread the pathogen. Plant-to-plant spread by overwintering corn flea beetles will continue until late May, when corn flea beetles lay their eggs at the base of corn plants. The overwintering generation of adult corn flea beetles then dies. This begins a "beetle-free" period lasting 2 to 3 weeks (early to late June), which ends as the next (known as the first) generation of adult corn flea beetles begin to emerge. During this "beetle-free" period, foliar insecticide sprays are not effective. The first summer generation of adult corn flea beetles emerges in late June, and feeds on infected corn plants. The beetles can acquire the bacterium, and facilitate the further spread of the bacterium to healthy corn plants. Later in the growing season, usually after pollination, the leaf blight stage may occur. Diseased plants at this phase exhibit long, wavy streaks (lesions) that are initially water soaked, and then turn yellow and die. Corn flea beetle feeding scars are usually visible within the lesions. If the disease is severe, whole leaves may wilt and die. A second summer generation of corn flea beetles will emerge about mid-August. It is this generation that can harbor the bacterium that will overwinter for next season. Mild winters during the past decade have resulted in an increased occurrence of Stewart's disease in Iowa. Two disease prediction models are available to predict the seasonal and county-level risk of Stewart's disease. These models are: the Stevens-Boewe Index Model, and the Iowa State Mean Monthly Temperature Model. Both models use the monthly mean winter temperatures that occur during December, January and February to predict the degree to which the corn flea beetle population survived the winter. The Stevens-Boewe Index predicts the severity (how much of the corn leaf tissue is infected) of the leaf-blight stage of Stewart's disease in the late summer. The risk is calculated by summing the average monthly temperatures for December, January and February. A sum below 80 indicates a negligible risk, 80 to 85 is considered low, 85 to 90 indicates moderate risk, and greater than 90 is considered a severe risk. Stewart's disease predictions based upon the Stevens-Boewe Index, for the late leaf blight phase of Stewart's disease throughout Iowa in 2009 are presented in the map below. The Iowa State University Model predicts the prevalence of Stewart's disease at the county-level. 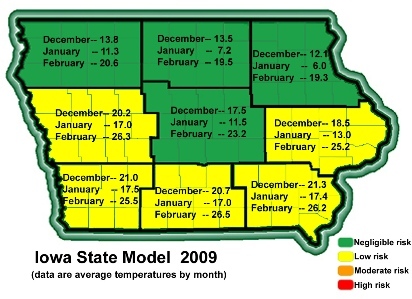 A high prevalence of Stewart's disease is predicted if the mean monthly air temperatures for December, January and February are each above 24 degrees F. The mean monthly temperatures for January and February 2009 in the northern three tiers of counties and in central Iowa were all well below 24 degrees F, and suggests that survival of large corn flea beetle populations were unlikely this winter. However, February temperatures in west central, east central and all of southern Iowa did average above 24 degrees F, which does favor slightly better flea beetle survival. The month-by-month average temperatures are shown in Figure 2. Continuous snow cover in parts of Iowa from early December to February could have functioned as an insulation blanket to protect beetles from subfreezing temperatures. Thus, corn flea beetle populations may be slightly higher than we project because of better-than-anticipated beetle survival in areas with persistent snow cover. The corn flea beetle populations in the fall of 2008 were extremely low and spotty so the anticipated risk of damage due to Stewart's wilt is still likely negligible statewide. Stewart's disease can be controlled on susceptible corn by controlling the corn flea beetle with a foliar-applied insecticide, but timing of the application is critical. Seed treatments also may provide a better approach to control. A 2000 study at the University of Illinois demonstrated that two insecticides, imidacloprid (Gaucho®) and thiamethoxam (Cruiser®), applied to sweet corn seed, reduced the incidence of Stewart's wilt by 50 to 85 percent under field conditions with naturally occurring populations of corn flea beetles. Field corn--prior to stage V5, 50 percent of plants with severe feeding injury and five or more beetles per plant. Seed corn--on susceptible inbreds, 10 percent of the plants with severe feeding injury and two or more beetles per plant. Labeled insecticides include, but are not limited to, Asana XL, Capture 2 EC, Lorsban 4 E, Pounce 3.2 EC, and Warrior. See manufacturer's labels for use rates and restrictions. Forrest W. Nutter, Jr. is a professor in the Department of Plant Pathology working on disease risk models for improved disease management. Alison Robertson is an assistant professor in the Department of Plant Pathology with extension and research responsibilities. Jon Tollefson is a professor in the Department of Entomology with extension and research responsibilities. Rich Pope is an extension program specialist working in the Corn and Soybean Initiative. Links to this article are strongly encouraged, and this article may be republished without further permission if published as written and if credit is given to the author, Integrated Crop Management News, and Iowa State University Extension and Outreach. If this article is to be used in any other manner, permission from the author is required. This article was originally published on April 15, 2009. The information contained within may not be the most current and accurate depending on when it is accessed.